The game of musical middleweight chairs for UFC on FX 8 has come to a conclusion. 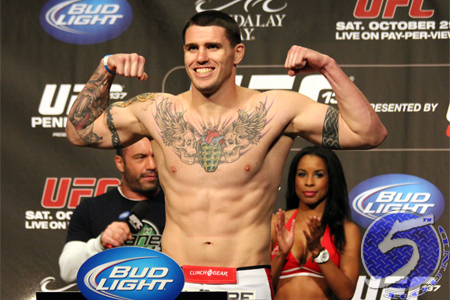 After watching Costa Philippou withdraw from his scrap with Ronaldo “Jacare” Souza due to a cut, Chris Camozzi (pictured) has agreed to face the former Strikeforce champion in the May 18 show. Camozzi was originally slated to fight Rafael Natal in the event, but couldn’t pass on the opportunity to co-headline the gig against stiffer competition. Natal will now meet Octagon rookie Joao Zeferino. The UFC confirmed the swap Friday morning. Camozzi collected his fourth straight win by taking a split decision victory over Nick Ring at UFC 158. Jacare, meanwhile, makes his big league debut riding a three-fight winning streak. UFC on FX 8 takes place inside Jaragua Arena in Jaragua do Sul, Brazil.